If you’re reading this, I would assume that you already know what a fishtail braid is. It is one of the most popular types of braid because of the undone look that reminds a lot of women of the off-duty model kind of hair. At the same time, it can add a whole lot to your look rendering it more stylish than your average braid. Indeed, it is a go-to hairstyle for women, especially during summer time when your strands can easily misbehave. The good thing about a fishtail braid is that even though your hair can get a bit messy, it still feels and looks like part of your overall hairstyle. Hence, you do not have to worry about setting everything in place. But even though the fishtail braid is quite popular, you can get weary sometimes especially if you have done the same hairstyle over and over again. If you would insist on wearing a fishtail braid, why not try unique variations to the braided hairstyle? Here are some ideas you can try to make your average fishtail braid more fun and exciting! This is an easy but gorgeous way to style your fishtail braid. And the best part about doing a fishtail headband is that it works for all types of hair textures and lengths. Essentially, you can create this hairstyle by forming two fishtail braids on the opposing sides of your head. Then, you drape those two braided sections under the crown where you can secure them to form a headband. There are no hard and fast rules to create a fishtail bun. 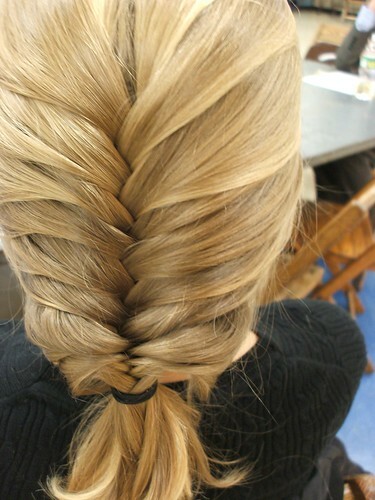 You can try it braiding tiny sections of hair into a fishtail braid and then twisting it around a bun. Or, you can also try braiding your hair from the crown until the end of the hair where you can twist it into a bun. This is a casual yet feminine hairstyle that isn’t too undone or too messy either. This is another feminine take on the fishtail braid. It is a great hairstyle to wear if you prefer to let your hair down, which also gives a boho feel to your look. You start by forming a side part. Then, twisting one side of your hair from the front and then starting a braid right near your ear. Continue braiding until you reach the end. Let the braided section fall loosely to the side of your hair for a casual and free-spirited hairstyle. Halo and milkmaid braids are also quite popular for women who love to wear their hair in an updo. Hence, why not try combining these braided hairstyles into one look? Start by braiding small sections of your hair in a fishtail braid and then using those sections to form a halo or milkmaid braid. It gives a modern update to this classic hairstyle. This is a simple update to your average fishtail braid: simply start from the top of your hair (right where the part is) and then allowing it to run down towards the end of the hair. Bring your hair together over to one side to make it look like your braid runs down from the root towards the ends where it rests on your shoulder. A rope fishtail braid is another fun twist to your fishtail braid arsenal. The key factor here is to prep your hairstyle so that it achieves lots of texture and volume. What is your favorite way to wear a fishtail braid? Any fun ideas you’d like for us to try? We’d love to hear about them in the comments! January 27, 2015 By: Abby Pringles Leave your comments (4), Your input matters. Rachael Nichol at Seventeen magazine has an interesting article on how to braid fishtails. I’m becoming more and more of a braids fan . . . especially for oval and heart face shapes. A braid hair style is not only a quick fix in summertime but just look at all the varieties you can do! If you have hair long enough to braid, don’t miss out on all the different looks you can have by learning a few new twists and turns. If you wonder what you may look like with shorter hair, try braiding or wearing your hair up and take note of what kind of reactions you get from others. Many times when I have a virtual hairstyle makeover client who is unsure about going to a shorter hair style, I will recommend trying braids or updo’s to see what kind of reaction they get from others. If you’re tired of the same old look, and want something cute for summer, give fishtail braids a try. Love fishtail braids, but don’t know how to make them? Grab a comb, clip, and elastic and get started now! Part your hair down the center. Beginning on the right side of your part at your forehead, twist a one-inch section of hair away from your face. Use a comb to separate a 1/2-inch section right below the first section along your face and twist that piece away from your face, combining it with the first piece. Continue adding 1/2-inch pieces along your hairline down to your neck. Use a clip or a bobby pin to hold the hair in place at the nape of your neck. June 1, 2012 By: Barb Quinn Hairstyle Blog Leave your comments (4), Your input matters.